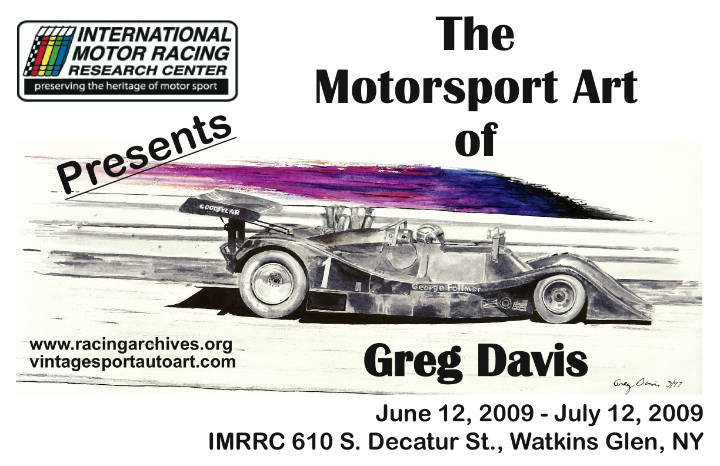 Works by motorsports artist Greg Davis of Westline, Pennsylvania, will be displayed at the International Motor Racing Research Center (IMRRC) in Watkins Glen, New York this summer, kicking off with an opening and reception on Friday, June 12th from 6:00pm – 8:00pm at the Center. The opening of the show coincides with the Historic Sportscar Racing (HSR) event at Watkins Glen International that takes place June 12-14. The reception will be open to the public. In addition to his art career, Davis operates a vintage car restoration shop and competes in Sports Car Club of America (SCCA) regional competition with a Laser F-Vee. His subject matter is almost exclusively sports and formula car racing and he works mainly with pen and ink wash and watercolors. “The functional beauty of these machines, the personalities and the history associated with the events involved has always inspired the artist in me. Some of my subject matter is based around the black and white photography that was so prevalent in the earlier racing magazines. I feel this era has a mystique and romance that these photos tend to project and I try to convey that through these images,” Davis said. The International Motor Racing Research Center, opened in 1998, is located in Watkins Glen, NY, and functions as a research library and an archive. This one-of-a-kind facility is supported entirely by donations from enthusiasts committed to preserving the heritage of motor sport and receives no support from federal state or local sources. The Center’s core collection includes more than 3,000 reference books, as well as thousands of films, race posters and programs, periodicals, club records and photographs. Additional information about the Center, its programs, and services can be found at www.racingarchives.org. Just stopped at the center in Watkins Glen and saw your work…very nice. In fact my wife said pick on out for an early anniversary present. Too many to choose from but I picked out the Ayrton Senna print. Very nice. In fact I met John McNight there and since I was lucky enough to shoot some photos for Autoweek many years ago, I may be sending some up. Perhaps you could use some as subjects! !